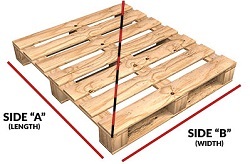 Black pallet covers are designed to help protect and conceal shipments. They conveniently come on a perforated roll for easy dispensing. The black opaque film also helps to protect products from UV rays. These pallet covers are designed for protecting products in outdoor storage. They are a great compliment to a proper stretch wrap to assist in protecting pallet loads. Click on the link to view all of our packaging supplies and machines.